Papa Steve & Nienna Handcrafted: What is Mohs hardness scale? When I first began working with gemstones years ago, I knew nothing about them except that diamonds were purported to be the hardest rocks on earth. I began researching and looking for semi-precious gemstones like Jaspers, Agates, Jades, etc. and I kept seeing a reference to this thing called "Mohs hardness". I had no idea what this meant nor did I think about or understand its importance, until... I began breaking some very expensive gemstones. This test is beneficial because most similar minerals are close to the same hardness making their hardness a reliable diagnostic property. For example: If mineral A can scratch mineral B, then mineral A is harder than mineral B. But, if mineral A does not scratch mineral B, then mineral B is harder than mineral A. However, if the two minerals are equal in hardness, then they won't effectively scratch one another or it might be difficult to see if a scratch was made. Now, if mineral A can be scratched by mineral B but can't be scratched by mineral C, then the hardness of mineral A is somewhere between the hardness of mineral B and mineral C.
How did all of this come about? A German mineralogist named Friedrich Mohs developed this scale in 1812. He chose ten minerals with distinctly different hardnesses from very soft (talc) to very hard (diamond). Now jewelry makers, mineralogists, etc., have a scientific way to measure the hardness of minerals. 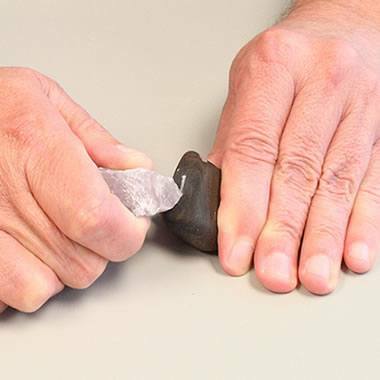 This comes in very handy when purchasing gemstones for wire wrapping. If the stone is too soft it may crack or even break completely. Of course, I learned this the hard way. But now, thanks to Friedrich Mohs, I know how to choose the perfect gemstones for all of my wearable art.